ONLINE – Recognizing that many people are not able to travel to visit Reformation museums and displays in 2017, four German museum organizations along with three American partners have worked together to produce a free Reformation-themed exhibition that anyone can download and print for free—or, alternately, view online. 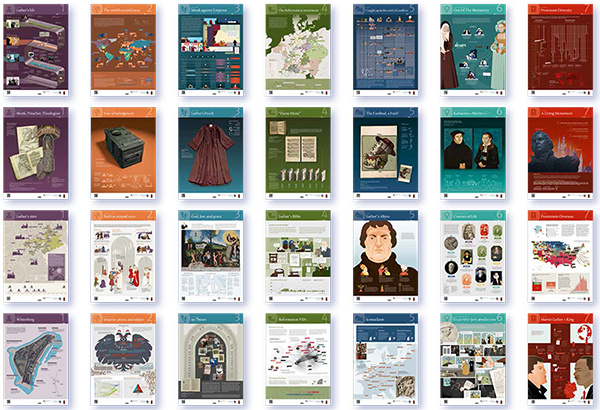 The exhibition “#HereIStand: Martin Luther, the Reformation and its Results” is a modular poster exhibition, meaning interested parties can print and display anywhere from 9 to 30 posters reflecting on the Reformation and its impact for today (posters are 84.1 x 59.4 cms in dimension). In addition to posters, #HereIStand also includes large images of high-quality museum exhibits as well as a number of 3D-scanned items. These objects can be downloaded and printed out on a 3D printer (although related costs would likely require such printing to be made on a smaller scale). Why not consider displaying the poster exhibit in your congregation as part of Reformation 2017 observances? Download the series for free at: www.here-i-stand.com/en/order. You will also find a promotional poster you can use to advertise the exhibition around your community. If you are not interested in printing the poster series yourself, you can also check it out online: www.here-i-stand.com/en/exhibition. Partners on the project include Germany’s State Museum of Prehistory Halle, the Luther Memorials Foundation of Saxony-Anhalt, the Deutsches Historiches Museum Berlin, and Foundation Schloss Friedenstein Gotha. American partners include the Morgan Library and Museum, the Minneapolis Institute of Art, and the Candler School of Theology at Emory University. Fantastic 3D images! Thanks for sharing this! !